Italy, September 2018: There’s no better time to walk in the Dolomites than in the Autumn, when the summer crowds have headed home, temperatures are mild, the wooded hills are ablaze with the golden hues of larch and beech, and there is often just a hint of fresh snow on the highest craggy peaks. This year, ADLER Spa Resort DOLOMITI has added another highlight to fall hiking in this UNESCO World Heritage Site, by adding sunset walks that allow guests to experience the “Burning Dolomites”. “Burning Dolomites” is the name of the natural spectacle created by the setting sun as it saturates the white rocks of the region’s distinctive jagged peaks with an intensity of colour that ranges from pale pink, through rich yellows and oranges to a final intense burst of red before the sun finally dips below the horizon, while simultaneously intensifying the golden tones of the trees and meadows. It’s a magical time, known as the golden hour in photography because of the deeper, softer hues it throws up, making the landscape even more “instagrammable” than ever. 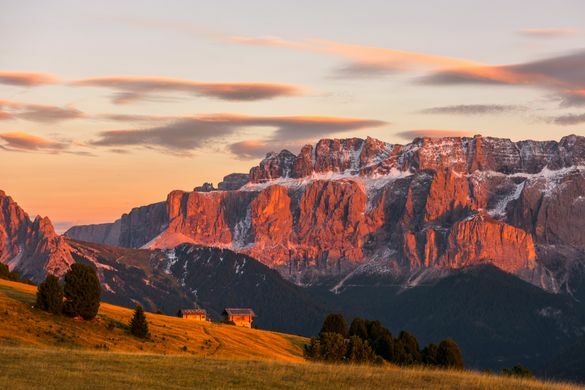 These sunset walks are led by the ADLER Spa Resort DOLOMITI’s inhouse guide, Thaddäus Moroder, who has been working for the hotel over 20 years and has, in that time, walked the equivalent of the earth’s circumference (40,000km +). He knows these mountains like the back of his hand and will ensure guests are in the right place at the right time, to get the most wonderful images to take home with them. Additionally, Thaddäus will regale hikers with captivating mountain stories and anecdotes he has acquired over the years, while pointing out the indigenous fauna, including the birds flying high above as they begin their migration south. The guided sunset walks will take place every week and will stop in mid to late October (depending on the weather). The walks will account for one of the two guided walks offered daily by the hotel on a complimentary basis. The routes of these hikes changes on a day to day basis, so one day it might be a family-friendly, four-and-a-half hour walk across Europe’s highest pastures and the next a demanding and varied ascent in the direction of Rasciesa, with wonderful panoramic views. All the routes form a part of the 13,000 kilometres of natural, well-marked trails in the region that lead through apple orchards, along irrigation channels, Alpine mountain paths and sweet chestnut groves, and across high meadows, while affording stunning views of the Dolomites’ pinky-grey craggy limestone peaks and virgin forests that pepper the landscape. Wildlife is abundant too – it’s possible to see marmots, eagles, white partridges and chamoix among others. Returning to the Adler Dolomiti after a long hard walk, complimentary use of the hotel’s 9000 square metres of private parkland and the largest wellness facility in the Dolomites await. The wellness area has three distinct zones: Dolasilla for beauty & vitality, Aguana where the pools, including thermals, are located, and AdlerFit with a full programme of activities – yoga’s always popular for stretching out muscles after an uphill hike! Prices start from Euros 480 (approx £425) for a three-day weekend break (Thursday to Sunday), per person sharing a double room. For more information and to book, go to http://www.adler-dolomiti.com/en/. ADLER Spa Resorts (http://www.adler-resorts.com/en/) is a bijou collection of four Italian properties owned and managed by the Sanoner family. On 9 January 1810, Josef Anton Sanoner acquired the first property – a small tavern called Daverda, which he renamed Gasthof zum Adler (Eagle’s Inn). That property, now known as the ADLER Dolomiti, has been passed down through the family, and is currently managed by the sixth generation of the Sanoner family. There are currently three other hotels in the collection: ADLER Balance and ADLER Mountain Lodge, also in the Dolomites, and ADLER Thermae in Tuscany.